In November of 2017, the new Camry increased its sales by a whopping 24%. In December of 2017, the Camry increased its sales by 35%, almost unprecedented in the current flat or slightly declining sales market the U.S. is presently in. Some would surmise the sales were due to year-end incentives. However, in January of 2018, the Camry’s sales continued to increase (by comparison to the prior January) with 16% growth. This past month of February, the Camry grew its sales by 12%. If anyone had any doubts as to whether the all-new Camry is a success, the evidence is pretty clear it is a smash hit. As a point of comparison, the all-new Accord, which switched to all turbocharged engines and has undergone its own extensive redesign, has seen monthly sales declines since November of 15%, 32%, 13%, and 16%. Nissan’s Altima is down 12% for the first two months of 2018. Despite having just had its best February in 18 years, the Ford Fusion is down 15% in 2018 as well. Chevrolet’s Malibu is not really even close in sales volume to the Camry and Accord, but as a point of reference, its low sales are also down in 2018. Normally, any given segments’ sales rise and fall more or less together. As crossovers grow in sales, most brands see increases in sales. As trucks grow in sales, most brands see increases. However, the 2018 Toyota Camry is growing robustly in a segment in which every important brand’s model is seeing significant declines. Making the Camry’s sales increases all the more noteworthy. 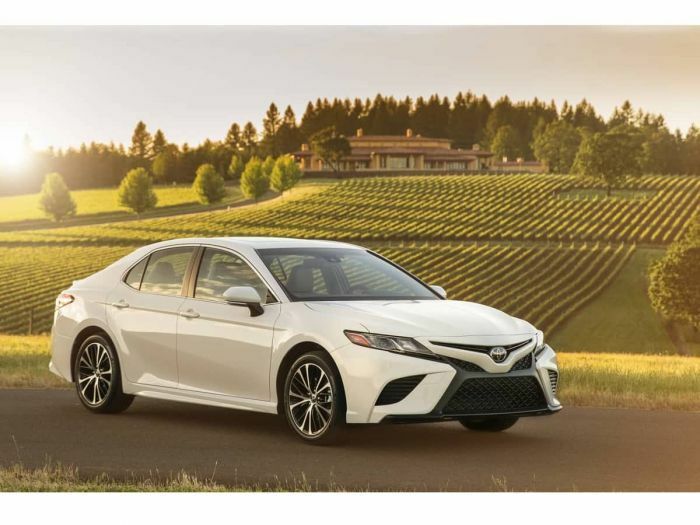 The 2018 Toyota Camry is an IIHS Top Safety Pick Plus-rated vehicle, the highest possible safety rating. Unlike many of its peers, the Camry includes active safety on every trim at no added cost. Redesigned for the new model year, the 2018 Camry rides on a new platform that has transformed its handling. The new Camry also boasts new engines and retains its V6 option. No doubt, Toyota hit the ball out of the park with the Camry redesign. However, I still must hand it to Honda Accord for interior quiet and seamless torque. Yet, at the end of the day Toyota fans will stick with Toyota; the #1 or #2 auto brand in the United States dependent on truck sale trends. Accord quiet? Seamless torque out of a turbo? Are you kidding me? 1.5 liter, 192 hp. Do you think this motor is creating noise? You bet cha! Surging turbo? You betcha! Gotta spend $31k to get a sunroof on a Sport. No blind spot on lower trims A +B =C. Loud car choppy ride, jerky turbo, lacks key features = 13% sales decline. Thanks for dropping in Curt. I hope all is going well for you at Toyota. Today I read an article attributing outstanding Camry sales to favorable factory lease incentives. Could be. By any measure, both Accord and Camry are largely reinvented for 2018. I enjoyed participating in the West Coast Camry media launch. it's impressive. I gave it a favorable review. However, it's not superior to Honda Accord, simply different. Have you driven the 2018 Accord lineup? Check it out and get back to us with a qualified opinion. Cheers! I wonder how many of the yellow and black two tone models they have sold like the one I saw at the NAIS last year? That car looked terrible, which must not matter to your typical Toyota buyer. Toyota is still be living off its "quality" reputation in spite of its rust, oil consumption, oil slugging, and sudden acceleration problems. You must be a Honda Salesman. Eric M makes a valid point. Is the reinvented Camry perfect? Bought the V6 two tone XSE, black over white. Toyota hit a homerun. I knew Accord going turbo is a mistake and “push button” transmission? Toyota reliability is important to me, as I plan to keep it a long time.